I made this quilt for my neice, Audrey. It was made almost entirely out of scraps from previous quilts (except for the backing). It was all machine quilted and appliqued. I normally plan out my quilts entirely before I start, but this one just developed as I went along. Is it possible to get a pattern for this beautiful quilt? I would like to make it for my daughter's first baby but as I am not a realy experienced quilter it would be great to have a pattern. This quilt is absolutely gorgeous. Excellent design. Might consider a similar design for my new grandbaby. I love this quilt...you did a wonderful job! I love the blended colors! 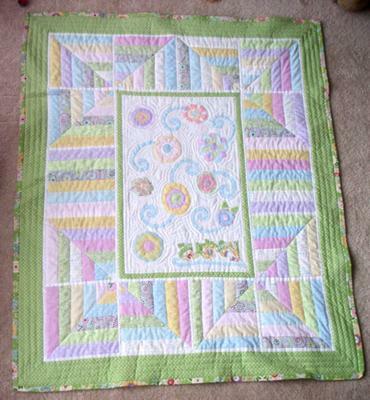 your quilt looks absolutely amazing, i would be so proud if i were able to make something of this standard and maybe my daughter would actually use it for her baby!! !